I love a change of season! After a crappy wet summer, Autumn has bought Sydney clear blue skies, lots of sunshine (with only a few scattered storms) & temps in the low-mid 20°C’s. Correspondingly, I love the change in seasonal produce. My local fruit & veg store is a hop, skip, jump away from me so I try to buy all my fresh produce there; it’s so much cheaper than the local supermarkets and surprisingly the weekend Growers Markets too (have you seen this sketch by the Brits? sooo funny!). Zucchini (aka green courgette) and their delicate little flowers are in season so what better dish to make than one with pasta al dente and a scattering of pecorino! Delish! 1 Detach zucchini flowers from baby zucchini. Tear flowers in half and thinly slice baby zucchini into rounds, then set aside. 2 Heat oil in a saucepan over medium-high heat, add zucchini flowers and cook until crisp (2-3 minutes), remove with a slotted spoon, drain on absorbent paper and set aside. Add garlic and onion to oil, sauté until tender (2-3 minutes), remove from heat, add lemon rind and juice, season to taste and set aside. 3 Meanwhile, cook pasta in a large saucepan of boiling salted water until al dente (6-7 minutes), drain (reserve 2 tbsp pasta water). 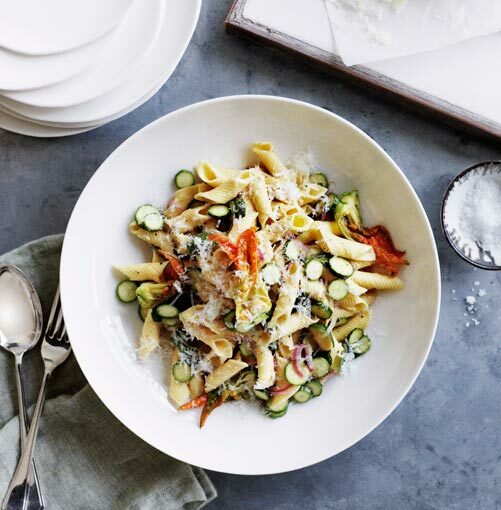 Return pasta and reserved pasta water to pan, add onion mixture, mint, pecorino and zucchini, season to taste and toss to combine. Serve scattered with zucchini flowers and extra pecorino. Looks great and sounds nice…but I’m sort of scared of the mint. It works, though, huh? its not overpowering and you can reduce it, but it gives it a fresh clean crisp taste that balances flavour of the oil and garlic and mint goes perfectly with zucchini & lemon!! !